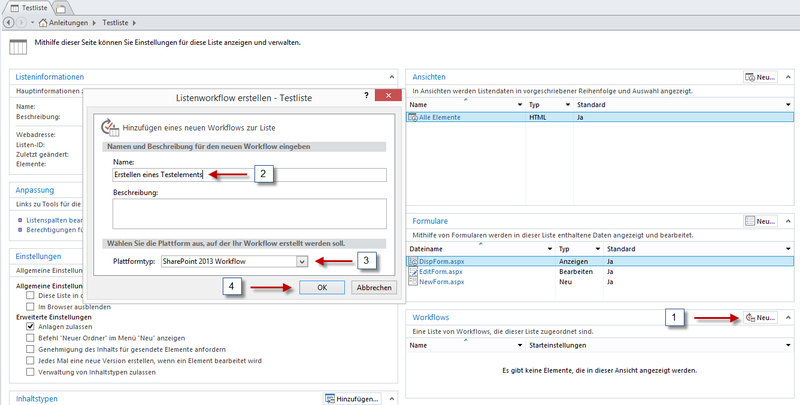 I will give here you a step by step guide how to create your first SharePoint Designer 2013 Worfklow. 2. 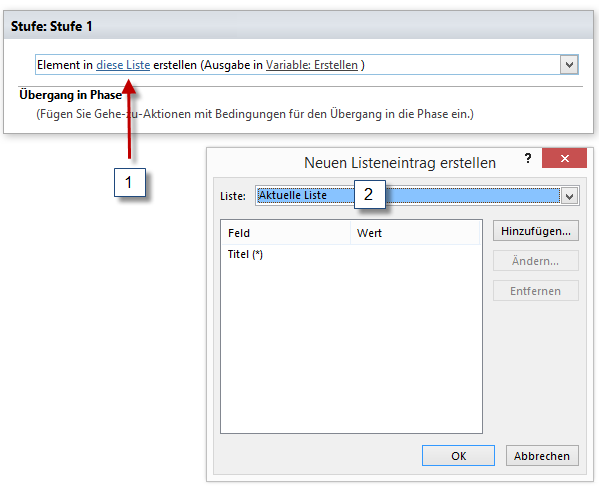 Next under the section “Beachtenswert” (Noteworthy) click on “Benutzerdefinierte Liste” (Custom List) (1). 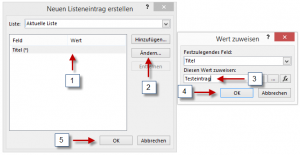 Then type in a name for the list (2) and click on “Erstellen” (Create) (3). 3. You will now get redirected to the “Websiteinhalte” (Site Contents). Click now on the title or tile of your new list. 4. 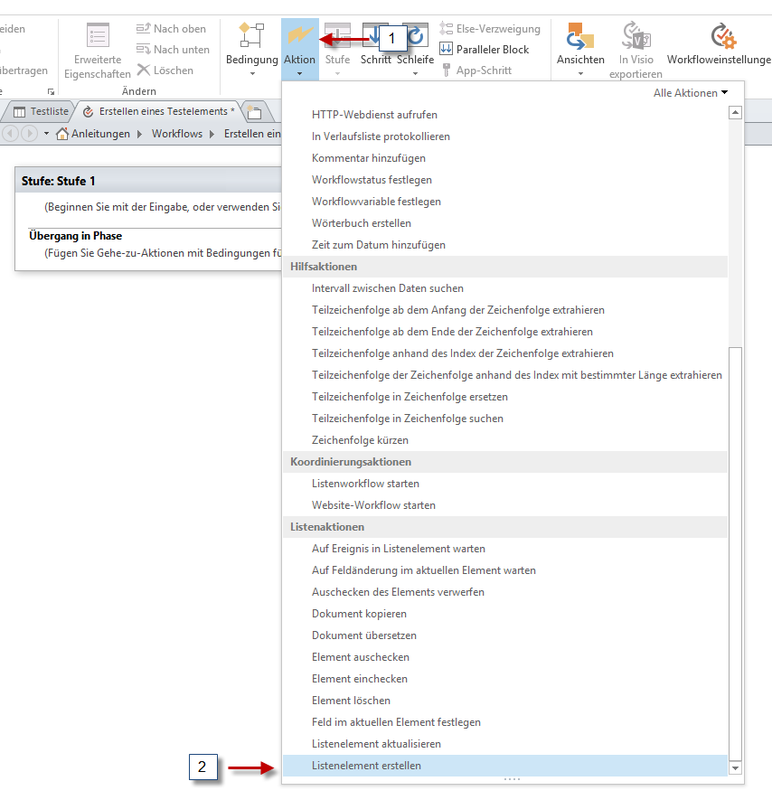 Click in the ribbon on “Liste” (List) (1) and then click on “Liste bearbeiten” (Edit List) (2). 5. 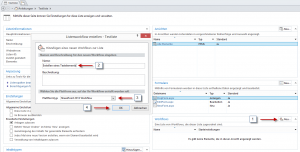 Maybe a popup will now show up because SharePoint Designer will open. Click on “Zulassen” (Accept). 8. 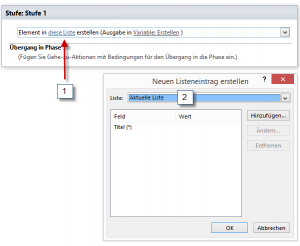 Click on “diese Liste” (this list) (1) and select the current list (2). 9. 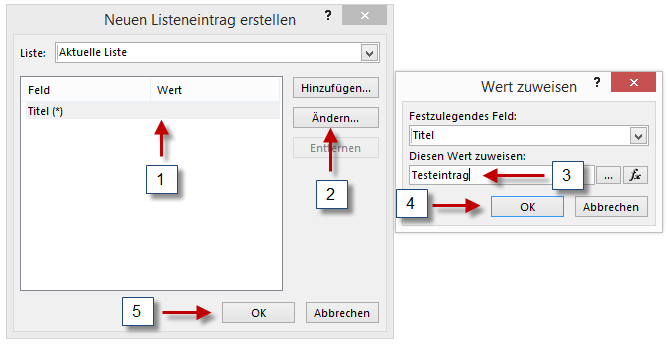 Select now the Title column (1), click on “Ändern” (Change) (2), type in a value (3), click on “OK” (4) and click again on “OK” (5). 10. 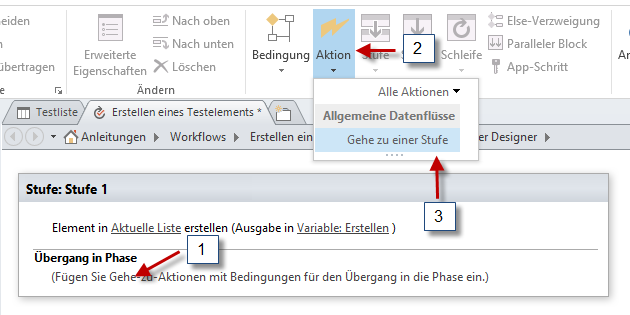 Click now in the last section of the workflow (1), then on “Aktion” (Action) (2) and click on “Gehe zu einer Stufe” (Go to stage) (3). 13. 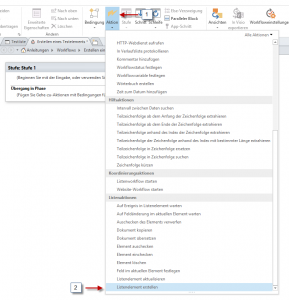 Now click on “Veröffentlichen” (Publish) and your workflow is done. 14. 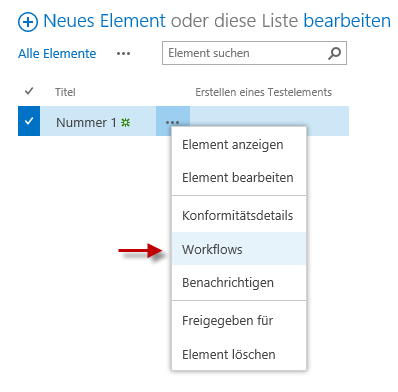 Now you create a item in your list (I called it “Nummer 1”) and then you have to click on the ellipses (…) and click on Workflows. 15. Now click on the new created link for your workflow. Note: We didn’t change the start options of the workflow. So in this case we have to start it manually. 16. After a page refresh you should be able to see the new created item from the workflow. 17. 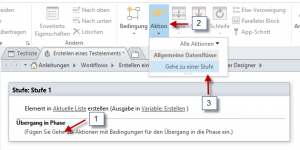 If you want to see the details of your workflow you can click on “Stufe 1” (Stage 1). 18. 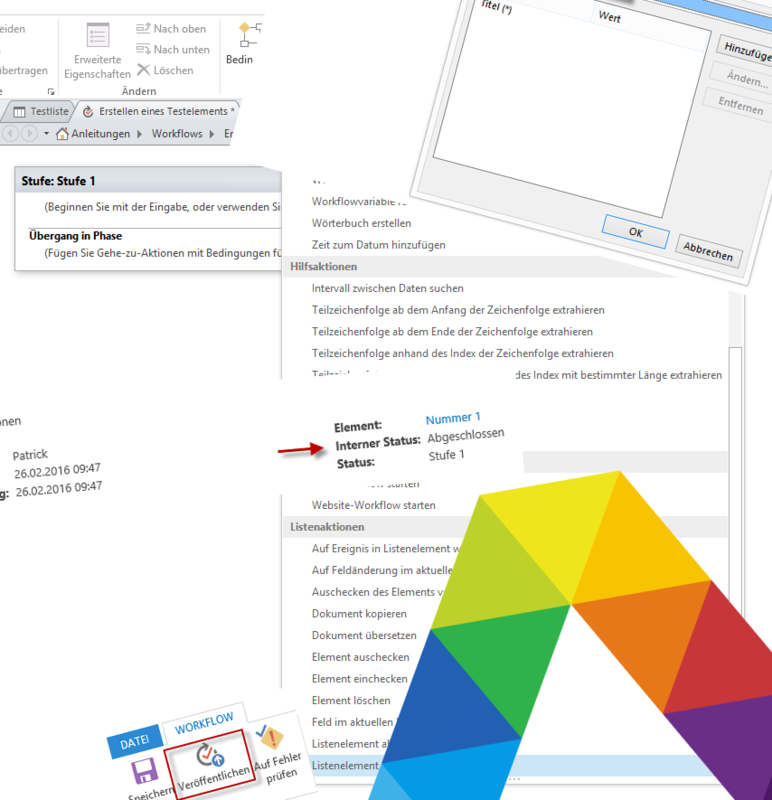 There you can see the details about your workflow. Hope this will help. If you liked to blog post please share it in your social medias. Did you know that afraIT is also at Facebook and Twitter? Check those pages out and follow them to keep up to data!